If you have a video that you would like to make more accessible, you can create closed-caption files yourself in a text editor like Windows Notepad. A closed caption is text that appears onscreen for a segment of time while a video is playing. Closed captions can be stored in a text-based file with a .vtt filename extension. You can create a closed-caption file on your own or use a caption-creation tool. This article describes how to create a closed-caption file yourself in Notepad. Creating a caption file isn't for everyone, but it is a suitable task for do-it-yourselfers. To search online for available tools and detailed instructions, type "create vtt file" in your search engine. The closed-captioning feature in PowerPoint 2016 is only available for Office 2016 Click-to-Run installations; MSI-based installations don't have the closed-captioning feature. Open an Office 2016 application. 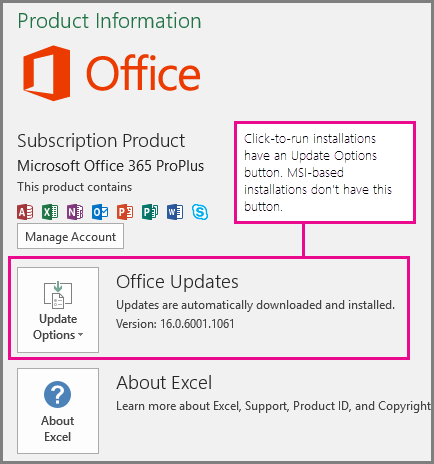 For Office 2016 Click-to-Run installations, you'll have an Update Options button. MSI-based installations don't have an Update Options button. You'll only see the About <application name> button. Notepad comes with Windows. Start the app by typing Notepad in the Cortana Ask me anything box or by searching for Notepad on the Start menu. A common practice is to include a two-letter language code such as "en" (for English) or "es" (for Spanish). The file name extension must be ".vtt". In the Save As dialog box in Notepad, enter a name in the File name box—including the .vtt filename extension—and enclose the entire name in quotation marks. In the Save as type box, select All Files (*.*). These actions ensure that the file is saved with the required .vtt filename extension (rather than a .txt extension). A time marker (beginning time and end time, separated by an "arrow", -->). Use two digits each for hours (hh), minutes (mm), and seconds (ss). Those three are separated by colons (:). After ss comes a period and three digits for thousandths of a second (ttt). Just remember to add the hours (00:) at the beginning and a third digit after the period to comply with the required time format. Text that should appear on the screen during that segment of time. In the example above, the first caption appears after the video has played for one second, and it remains on the screen until 5.330 seconds of the video have elapsed. The next captions appears after the video has played for 7.608 seconds, and it remains on the screen until 15.290 seconds of the video have elapsed. The second caption is broken into two lines to help ensure that the statement is not too wide to fit on the screen. Once you have a completed closed caption file, save it. Then you are ready to add it to the video in PowerPoint.